If you do a quick search for "toscakaka" you'll find that it's a traditional Swedish cake comprising a light, buttery sponge with a crunchy almond and caramel top... Aaaaaand, that's pretty much it. While most classic [insert nationality] cakes come with a story it seems the toscakaka has become tradition simply because it's so good, and I for one see no problem with that. What makes the toscakaka so good is its succinct epitomisation of the perfect home-baked treat. Looking impressive while requiring minimal effort it screams indulgence without being overly so, and is plain enough for you to easily play around with the flavours and give it your own personal touch. As we're still riding the coattails of summer I chose to lace mine with lemon and blueberries, but can certainly see myself doing a plainer version in autumn to serve beside poached quince and crème fraîche, then maybe some bay-infused browned butter to add warmth during the winter months. However you choose to adorn it the toscakaka is a great one to have in the repertoire, be it for impressing friends and family, or as a pick-me-up when the craving calls. With its pillowy sponge and moorish, crunchy top it's the ultimate cup of tea accompaniment. So, what are you waiting for? Preheat the oven to 160℃ and grease and line a 20-cm round springform tin. For the cake batter, melt and lightly brown the butter and set aside. Whisk together the sugar, eggs and vanilla, until pale and thick. Sift together the remaining dry ingredients and then fold into the egg mixture in two batches, alternating with the buttermilk. Gently fold through the melted butter and then carefully pour the batter into the prepared pan. Sprinkle with blueberries and bake for 50-55 minutes, until lightly golden. 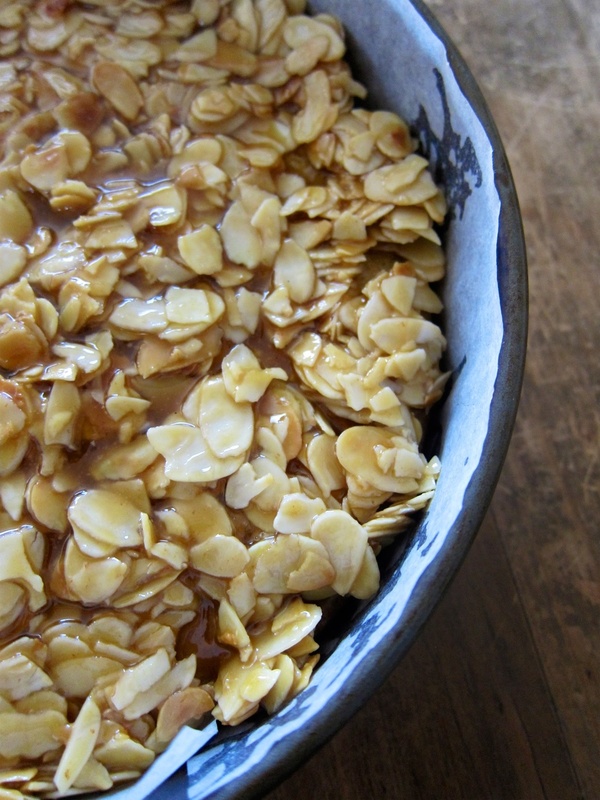 While the cake is baking prepare the almond topping. In a wide pan gently toast the almonds until golden, then remove and set aside. Add the remaining ingredients to the pan and heat until bubbly and thick. Stir through the toasted almonds and set aside. When the cake is ready, remove it from the oven and turn the temperature up to 200℃. Spoon the topping over the cake and spread it out in an even layer. If the topping appears to have set, rewarm it a little before spooning it onto the cake. Return the cake to the oven and bake for a further 12-15 minutes, until dark and golden. Leave to cool for 5 minutes before loosening the sides of the tin and transferring the cake to a wire rack to cool. Serve at room temperature.